PanARMENIAN.Net - The number of severely injured Azeri soldiers exceeds the military norm by 3-4 times, the head surgeon of Azerbaijan's armed forces stated. As Famil Babayev noted, the condition of those injured suggests “extremely potent” weapons were used against them. “The number of those severely injured shouldn’t go above 10-12%, yet in this case it reaches 40-45%, which proves that large caliber and extremely potent weapons were used against them. Over 40 splinters were found in the body of one of the injured soldiers,” Babayev told an Azeri newspaper, according to 1news.az. The parties to the Karabakh conflict agreed on a bilateral cessation of fire along the contact line which came into force at midday, April 5. The Armenian side has suffered 77 combat and 15 non-combat losses, 122 more were wounded. One soldier is still missing. The Azerbaijani side has lost 26 tanks and 4 infantry fighting vehicles, as well as 1 BM-21 Grad multipl e rocket launcher, 1 engineering vehicle, 2 military helicopters and 14 unmanned aerial vehicles. The Azerbaijani side has admitted the loss of 31 fighters, 1 helicopter and 1 unmanned drone, whereas the Armenian side's photo and video materials show dozens of killed Azerbaijani troops, 1 helicopter and 3 UAVs. Opposition media outlets, however, reported on the death of 95 Azerbaijani soldiers, stating that 39 more have been wounded. 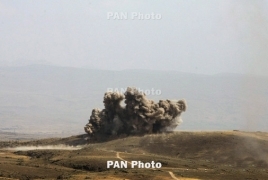 According to Karabakh authorities, 300 Azerbaijani soldiers were killed in clashes.